Last month, Martha fell and injured her hip. While it wasn’t broken, she is now enduring physical therapy twice each week and adjusting to getting around the house with a walker. Before her fall, Martha was an extraordinarily active 78-year-old woman who enjoyed working in the garden, daily walks with her dog and keeping a tidy house. Now, she finds herself often frustrated by her lack of ability to move with speed and ease. Since her fall, however, Martha has been receiving daily visits from a home health aid with a local private duty agency to help around the house. During her visits, Martha feels that her aid is helping her move better and providing some relief from that frustration of not getting those weeds pulled! 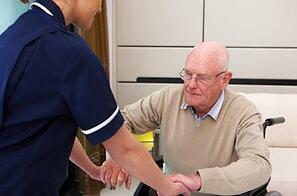 In home caregivers can play a vital role in assisting seniors with mobility issues. Whether due to an injury, or long term disability, mobility restrictions can be a trying hurdle for seniors to overcome. However, caregivers armed with the proper knowledge, skill set and a homecare software or homecare system to help manage their tasks can prove to boost the morale – and mobility- of seniors at home. In-home caregivers should be aware of, and properly matched to, clients with mobility issues prior to taking on an assignment. For example, caregivers with a bad back are less likely to be comfortable helping a senior move to and from a wheelchair or assistive device. Utilizing a homecare software or homecare system, such as ClearCare, to help pair clients and caregivers will ensure the caregivers are properly equipped for the job. Additionally, training caregivers to be familiar with mobility devices such as walkers, rollators, wheelchairs and motorized scooters will give caregivers the confidence to assist clients in using devices as well as encourage mobility. Some clients, like Martha, may be hesitant to use assistive devices that they are unfamiliar with. For example, when she was released from the hospital, Martha came home with a rollator, designed to provide support while she walked and a place to rest. However, she strongly disliked the idea of using it; simply because it was something new. A caregiver equipped with knowledge of how to use the device, and a task via her agency’s homecare software or homecare system, can help encourage seniors like Martha to become familiar with their new device and use it throughout the day. This use often translates to increased comfort and ability to modify tasks that otherwise seemed no longer possible. Keeping home care clients who are capable up and moving is good not only for joints and circulation, but also for mood. In home caregivers can encourage clients to move to different areas of the home with them as caregivers take care of different household needs, and even take a coffee break outdoors. While Martha can’t pull her own weeds right now, she’s found joy in rolling out to the garden with the assistance of her caregiver and watering the garden together. That time out of the house makes her feel like she can do more than move from the couch to bed, and gives her confidence that she’s on a path to recovery. The movement also allows her home care provider to note any changes in condition, complaints of pain, or comments on healing via tasks in her agency’s homecare software and homecare system for care coordinators and family caregivers to easily view and assess improvements or need for additional care. While loss of mobility can cause frustration for seniors and fear for family caregivers, in home caregivers equipped with a robust homecare software or homecare system, such as ClearCare, can help with a smooth transition.